Parlez-vous Cajun? | Turning my world upside down! 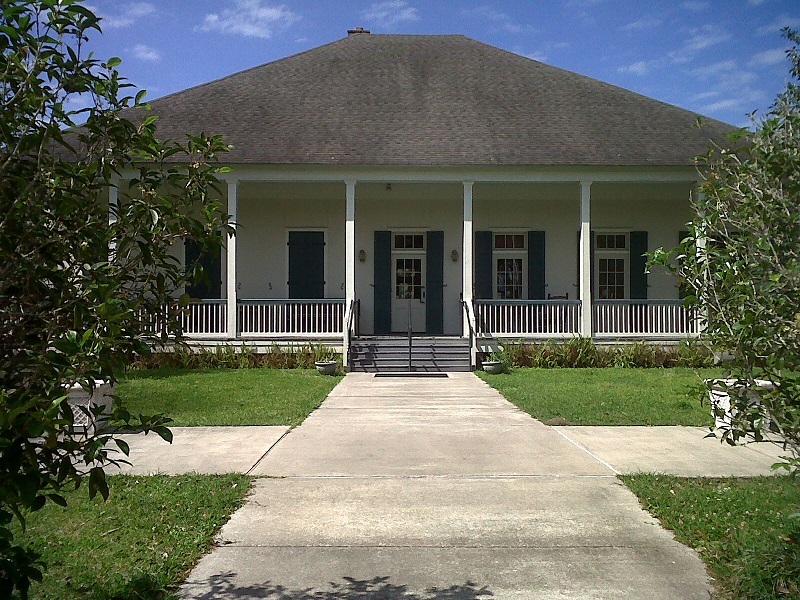 The main building of the Longfellow-Evangeline Historical Monument. We noticed many of the homes in the area had that high roof. We had a very restful night at our campground, except neither of us slept that well. Maybe it was too quiet? Maybe those little crawfish critters were still moving in our bellies? No, just kidding. 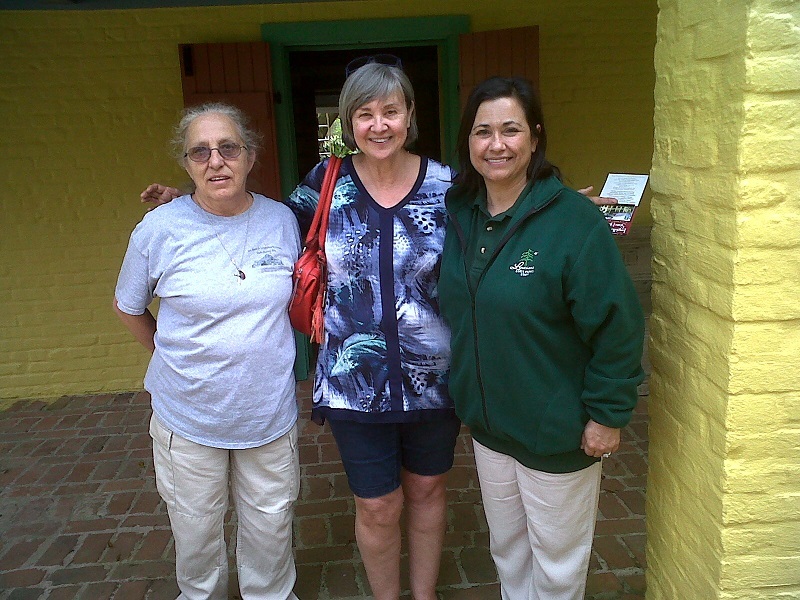 The plan today was to explore some of the Acadian history deep in the heart of Cajun country – St. Martin’s Parish. You already know something is different in Louisiana because the areas are set up as parishes, not counties. Pretty cool. So far the terrain has been filled with water. You are never far for a source of water anywhere in Louisiana. It’s either a swamp, a lake, a pond or a bayou. Maybe a river or a creek? We drove through St. Martin Parish to St. Martinsville, a quaint town with French names on the streets and cute shops, but we didn’t stop. I wanted to see the Longfellow-Evangeline State Memorial. Now Longfellow never visited these parts and Evangeline is really a fictional character that depicts the plight of the Acadians during “Le grand dérangement”, but his poem brought to light the ordeal this displaced nation endured in the 1740s. If you remember your history, French settlers were brought to Nova Scotia to use their skills to settle the land and improve agriculture. The Acadians were particularly suited at working with wetlands and levees. When the British wanted to control those lands, the Acadians refused to pledge allegiance to the British Crown as it might mean they would have to take up arms against their former countrymen. The British deported them very suddenly, burning their homes and lands, separating families. Some were sent to France, some ended up in other provinces like New Brunswick, Quebec and Newfoundland and some were sent south to places like Maine and South Carolina. In many of these places, they felt unwanted as they had a different language and religion, being French and Catholic. You can read more about the Acadians in a previous post I wrote following our visit to Grand Pré, NS. The Acadians who eventually came to Louisiana only arrived about 9 years after they were deported. Of the survivors of these ordeals, about 8000 were brought to Louisiana by the Spanish to help settle the lands. Until then, Louisiana had been inhabited by the French and Spanish whose American born children were know as Creole. The local African slaves whose parents had been brought here were also called Creole. These slaves were especially prized as they knew the land and local climate so they could work more efficiently. In 1803, the French had reacquired the lands from Spain and sold them to the US. You can see how this state has a flavour all its own. With that in mind, I really wanted to speak French to someone local. I inquired at the Evangeline Historical site about any French speakers. I was delighted to make the acquaintance of Debbie (Leblanc) and Carisse (Savoie). Oh Debbie’s French, so melodic, just as I had imagined. She took us on a tour of the old plantation house, explaining how they lived in those days (1800s). We talked about how she learned French from her grandparents. Carisse had a different lineage, being of Acadian and Spanish heritage. She learned her French from her greatgrandparents. How lovely is that? I asked about a local delicacy, boudin, which to me is blood sausage. Debbie said that would be called red boudin and it wasn’t made very much anymore, although she remembers loving it when her grandparents did the slaughter and made that delicacy. We had fun talking about the similarities of French culture. 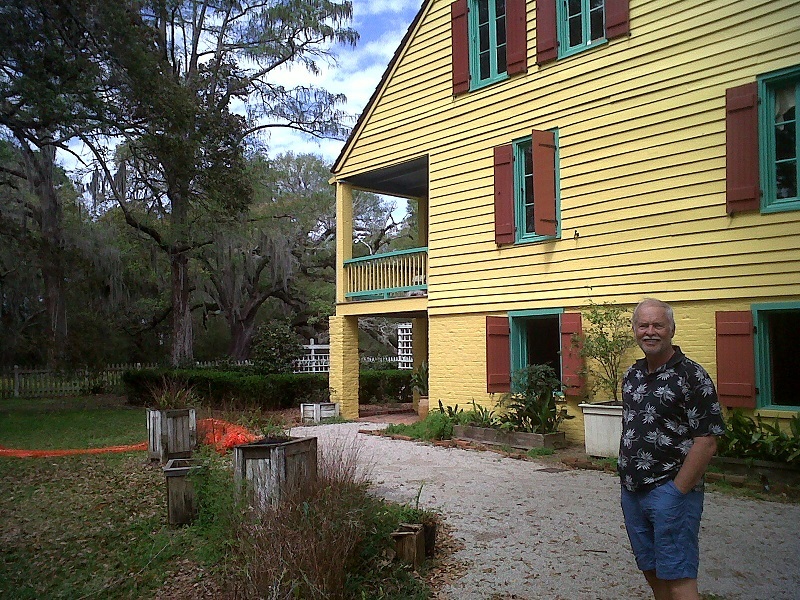 During the American Civil War, the Union soldiers came to St. Martin’s Parish and used some of the old plantation houses for their own. However, they did not destroy much of it. 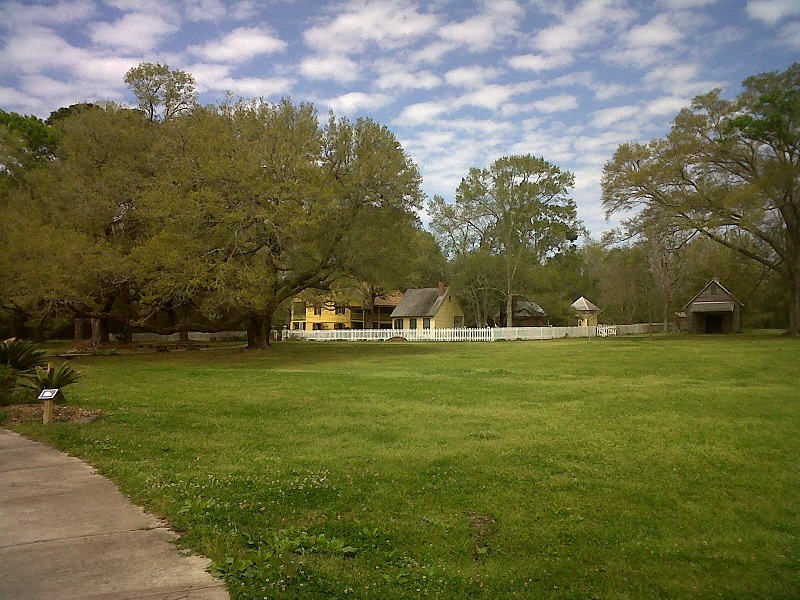 The Olivier Plantation, which is the site of the Longfellow-Evangeline National Memorial, was burned down so that the plantation could now continue to function but the house remained. Over the years, it was maintained by the Historical Society until the government took over its care. I wanted to thank Debbie and Carisse again for sharing their stories. I hope they are retold and never forgotten. Merci mes amies! Ce fut un grand plaisir! PS, if you are still wondering about those mud mounds I told you about in my last post, well here is the answer to that. Surprised? I was! Thanks for the heritage update. My family, mother’s side, originated in the New Brunswick, Canada area. So interesting to speak our native tongue in these far away places. You and Helen blew me away when I spoke French to you. I could have been speaking with my own relatives. Vos histoires sont aussi un grand plaisir pour moi … surtout celles de mon héritage … !!! Les Cormiers sont aussi parmi les familles Cajuns. Notre guide, Debbie les a mentionés.Cool einh? Such an interesting blend of cultures and languages. Always fascinating to find my French roots in different parts of the globe.